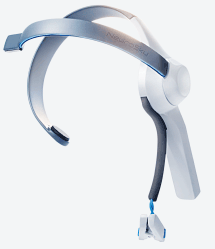 While still on the subject of head mounted displays, I recently noticed that NeuroSky announced a partnership with the Haier Group to integrate NeusroSkys brainwave detection technology into their latest 'Cloud Smart' TV, due for release later this year..
As neurons in the brain interact, for example as a result of thoughts or changes in emotional states, they generate small electrical charges which can be measured using specialist EEG (ElectroEncephalogram) equipment. NeuroSky's mission is to make the technology available to a wider market outside of the laboratory, and they have produced the MindWave device for under $100. Their technology can detect and convert electrical impulses generated from concentrated mental states into digital signals that can be used by electronic devices and ultimately, as suggested in this case, changing channels or adjusting the volume on a TV.